We're finally getting over the "ick" here at our house. It's been a long week! I'm sure looking forward to brighter, warmer, spring days filled with fresh air and sunshine. My simple thing today is cherishing childhood moments that are wild and carefree. 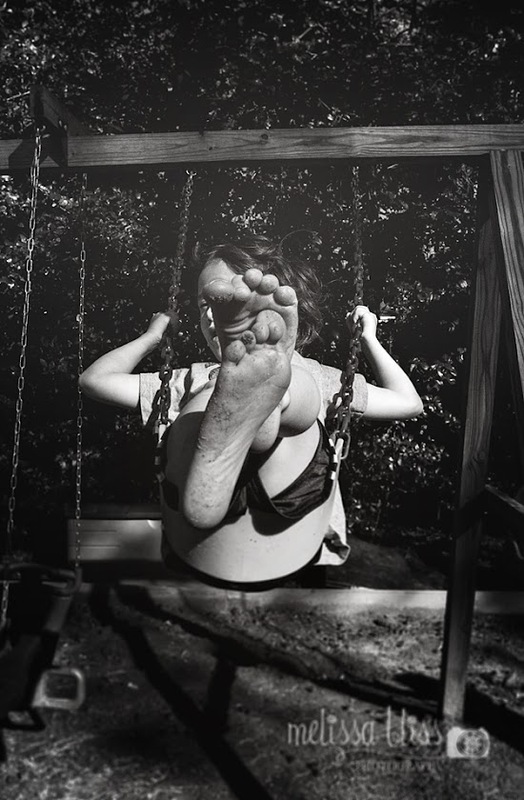 What embodies that more than a little boy swinging barefoot, kicking his heels up to the clouds? That's how this 5 year old likes to be. Can you blame him? This could not be more perfect, Melissa! It absolutely screams carefree happiness. Glad to hear that everyone is feeling better. Wishing you a bright beginning to your week! What a fabulous shot Melissa!! :) Thanks for linking up this week. Absolutely stunning. So much joy! Oh I just love grubby bare feet!! Life is good when you can run around in your bare feet! Great capture. It is so good that your house is on the mend. love the perspective of this shot!! makes me long for bare feet and warm temps!! great shot! I love swing pictures and I always think of the word free when I see someone swiinging. very nice shot.